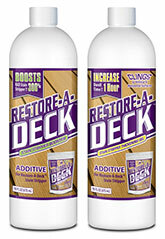 Once you receive your DIY deck kit, you are ready to beautify your hard earned investment. These instructions will also be sent with your kit. 1) Put on your optional safety gear (protective eyewear, gloves, and mask) The chemicals in R-A-D are mild but can irritate those with sensitive skin. For liability reasons, we recommend always wearing safety gear. 2) Open the red labeled container marked "Professional Grade Cleaner"
3) Fill your 5-gallon bucket with warm water. Leave some space at the top to allow for foaming and stirring without spillage. 4) For aggressive cleaning or when mold growth is present, pour one red labeled container (Step-1) into the bucket and stir contents until dissolved. 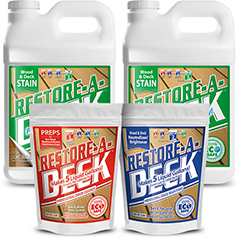 If you are going to reseal with the same sealer that is presently on the wood and there is no visible mold growth, you can use half of a container. This will yield milder cleaning action. On grayed wood always use full strength. 5) Prepare the area surrounding the deck by wetting all vegetation and soil generously. If you have landscaping directly under the deck, you may prefer to use plastic to cover. Though biodegradable and not harmful to soil Ph this cleaner may cause temporary browning of plant life. The plants regenerate in about four weeks but we understand this may not be desirable. Use your discretion. In our experience, keeping the vegetation wet with clean water prevents this from happening altogether. 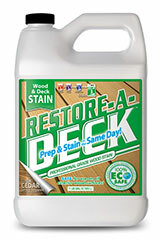 6) Spray the entire surface to be cleaned with Restore-A-Deck cleaner. Apply generously. Note: It is very important to keep the wood wet with solution. Work in small sections and go back and re-wet any sections that appear to be drying. 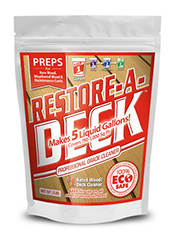 7) Let Restore-A-Deck dwell for 15 minutes (new construction or no previous sealer on wood) to 20 minutes (mold covered or previously sealed). Keep the solution wet by re-misting frequently. If the product dries, it is not working. 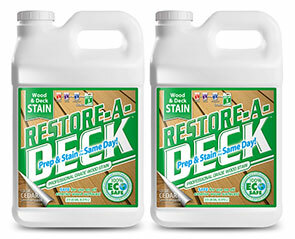 You will see Restore-A-Deck cleaner's foaming action pulling the dirt from the wood fibers. Note: While the product is dwelling, it is a good time to re-wet surrounding vegetation. 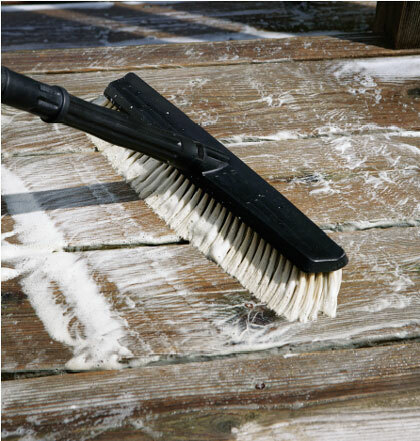 Note: Depending on the level of care your deck needs, heavily grayed wood may need brushing especially if you are not using a pressure washer to rinse. 8) The rinsing process is critical. If you are comfortable using a pressure washer you may speed up your rinsing process by using one. Keep your tip at least 12 inches from the wood surface. If you are using a garden hose, set your hose attachment to the strongest setting and rinse slowly and thoroughly. Error on the side of caution. When you think you have rinsed the deck thoroughly, rinse it one last time. 9) As a final step rinse everything that has come in contact with the solution including siding, windows, or plant life. It may seem like overkill, but doing the job correctly should be your goal. The deck brightening stage is where the magic begins to happen. Follow the same steps and mixing process as above using the blue labeled "Professional Grade Brightener" being sure the pump up sprayer you are using is clean. 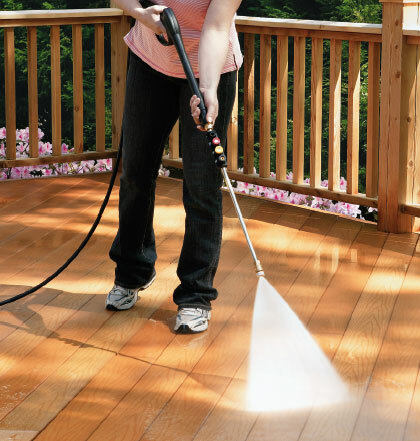 We recommend using two separate sprayers, one each for the cleaner and the brightener. You may use a single sprayer doing a triple rinse process making sure no cleaner remains in sprayer tank or hose. You are now ready to apply the finish of your choice. We recommend using a high quality, semi-transparent stain for maximum durability. Cleaned & Brightened last night and then had a light rain.. am I okay after a few hours to stain the damp wood with my restore a deck semi no problem? Yes, you will be good. I cleaned and brightened my 4 month old deck. I have finished applying the semi-transparent Armstrong/Clark stain to my banisters/spindles, but not the decking. Its been 3 1/2 weeks since brightner applied - is it OK to apply the stain to the decking? If not, will the cleaner &/or brightener affect the banistrs/spindles already stained?? Thanks, Lyle..
Lightly brighten the wood and pressure rinse (not wash). This will not harm the rails. 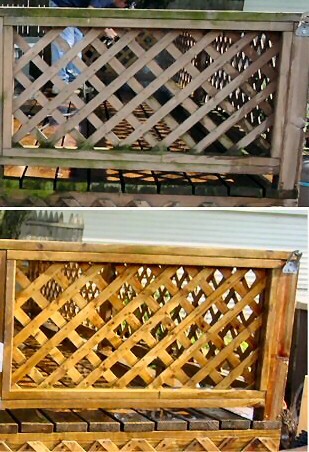 I plan to use RAD step 1, then step 2, through the cleaner dispenser on my power washer on my fence before staining with a different oil based product. Do I still dilute the powder 3/4 - 1 cup with 1 gallon of water, or should I make it more concentrated since the power washer will be mixing the cleaner with water coming in from the hose? The RAD Step 1 cannot be injected through a pressure washer. Needs to be pump sprayed on. The Step 2 could be injected at 1 cup per gallon. We live in Northest Ohio where you can see all 4 seasons in one day! 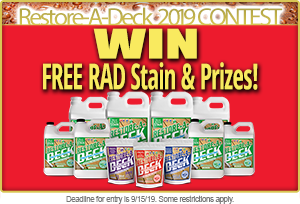 We are getting ready to apply our stain..all RAD products we purchased through you...however we have about a 50% chance of rain tomorrow..should we hold off until we are sure to have 48 hours with no rain or is it okay to proceed? Thank you! You are okay with the staining if rain is coming the next day. 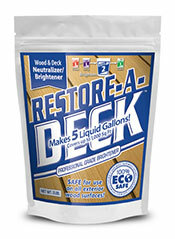 Despite our best efforts, some of the restore-a-deck wood stain hit our lock-dry aluminum decking in a couple places while we were staining the rails and dried instantly. The suggested soap and water do not work at all to get it off... What do you recommend for removing any spots where the stain has dripped onto surfaces during application? Try a water-based graffiti remover. Should be in the paint section at your local store. The brightening directions above state "Allow three consecutive and sunny 75+ degree days. You are now ready to apply the finish of your choice. We recommend using a high quality, oil-based, semi-transparent sealer for maximum durability." 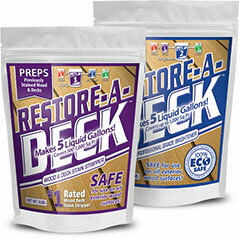 This seems to conflict with the Restore a Deck in one day claim. Do I wait 3 days or not? Also, is the RAD stain oil-based, since this is recommended in the above Brightening instructions. Thank you. The RAD perp and stain can be done in one day. This is an old article that needs to be updated. Started using the deck stripper today on a redwood railing, prior to working on large deck. I let it sit for 15-20 minutes but noticed the product seems to dry on the old stain in less than 5 min. with the sun hitting on it, so I kept respraying over the area to keep it moist. I then removed the product with a scrub brush and it worked great. Super product! Question: will the product still work effectively if, after it is sprayed on, appears to dry in the sunshine prior to the 10-20 min before removing it? I hate to have to keep respraying the same area to keep the product wet on the redwood. If it dries you will need to re-wet to get it to work. If you have a pressure washer, it will be much easier and faster to keep it wet during the process and for removal. You will not need a scrub brush. While using the cleaner, do I need to brush the surface if i'm working with new cedar (weathered about 6 months with no mold or graying)? I will be using a pressure washer to rinse. Apply the Cleaner and pressure wash off is the best way. can I apply RAD with a mop type equipment or does it have to be applies with a sprayer? and about how much coverage should I get with one kit? Sprayer is best but you can mop it on for applying.